Window Covers - Interior or Exterior? 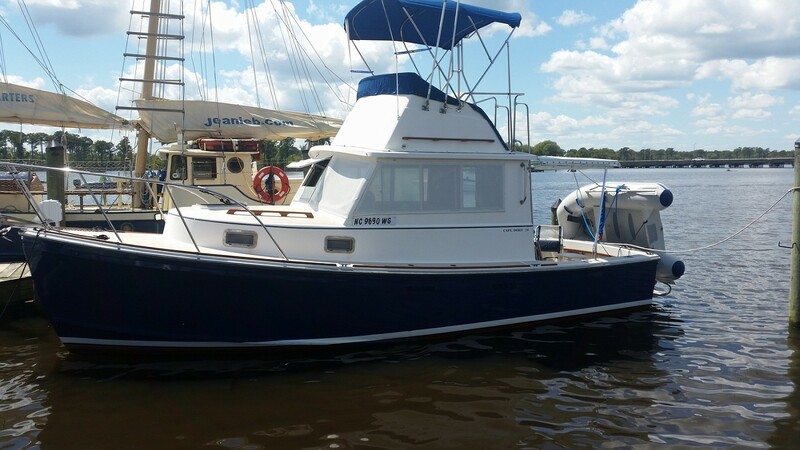 We have a new-to-us 1990 Grand Banks 32 with no side window covers. We want to add them, to lower heat inside boat and to minimize fabric fading inside. 1. Exterior semi-opaque mesh fabric using regular snap fasteners. Pros: relatively lower cost, reasonable heat and light protection, Probably can remain on when operating from lower helm. Cons: hassle to put on and remove. 2. Exterior fully opaque "Sunbrella" snap on covers. Pros: relatively low cost, probably best light and heat protection. Cons: Must be removed when operating from lower helm. Big Question: Does anybody know the comparative interior heat reduction value of interior versus exterior window covers? Will the mini-blinds reduce the heat as well as the light? 2nd Question: Any other ideas? 1990 GB 32 "Polar Star"
Oldersalt, Despite being in the perpetually rainy and cold PNW, we are wondering about the same thing. Exterior solid covers will protect from the sun and heat the best, but you will always need to remove them when underway. In our situation, that would be a pain as we have no side decks so the side not next to the dock finger would be hard. Exterior mesh works well from what I understand and there are plenty of boats in my area that use them. They cut down on the heat significantly and can be left on as they allow visibility (to an extent) from the inside. They also can serve double duty as insect screens according to some. The downside is that like the solid covers it means attaching snaps to the exterior of your boat, something that my wife really doesn't like. I also have wondered if the will be as easy to see out of if they are wet due to rain (it does rain here all the time after all). Interior blinds. These would be easy to operate and give you the most flexibility as far as light control and unlike the mesh exterior give you privacy at night. One thing that I would want to be sure of is that they are installed in such a way as not to rattle against the windows in rougher seas. That would drive me nuts. The other option would be to use one of the cell type blinds. They could provide more insulation, would be quiet, and in my wife's view more attractive than the classive miniblind. However, the mini blind does allow you to view out while still providing some light control. The best option, but probably the most expensive, are the fabric blinds that are a bit of a hybrid. They have interior vanes inside a fabric blind. The vanes can be opened or closed depending on your needs and still provide some visibility. I would get both exterior mesh covers and interior cellular blinds. The exterior covers will prolong the life of your window frames, and to a great extent the plexiglass (if you have that) window panes. It will also reduce the sunfading in the inside on upholstery and all else. I only operate with mine down (see through mesh) if I am getting underway and intend to go immediately up to the FB once lines and fenders are in and stowed. It wasn't inexpensive but I had all my windows covered (inside) with a special 3M film that reduces heat gain while not reducing light (important for night travel). I also have curtains but insulated curtains would be better. I have a canvas cover for the front and it works but obviously blocks nearly all of the light. It's nice for sleeping but makes the boat seem like a cave during the day. Anything on the outside is going to be more difficult to install and remove. 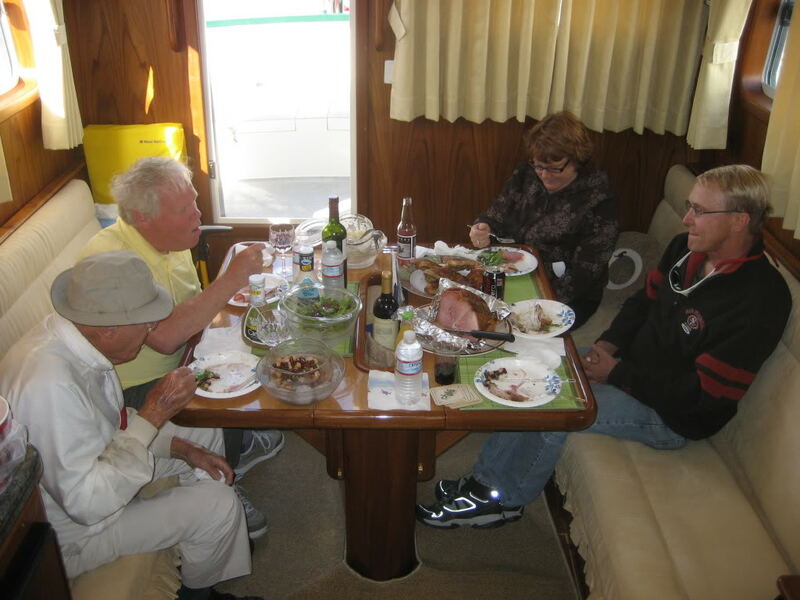 Oldersalt, I boat year-round in the land of micro-climates like you....SF Bay and CA Delta. My 34 Californian is similar in size and layout to your GB32. I have no air conditioning but enjoy extended trips into the Delta during the summer months. Here's what we have and appreciate in our area. Exterior: approx 80% (a guess) transparent sunscreens snapped to the outside. These wrap around the windshield and both sides. Nothing outside on the 4 aft windows, but we have a cockpit canvas that shades the back porch! ;-) These shades can remain in place as long as conditions don't cause them to get wet. When they get wet, they cling to the windows, severely restricting visibility. When this occurs, I have to remove the screens. Normally, I remove the side screens before departure in all but the warmest of Delta climes. The windshield cover always gets removed before we're underway. These screens provide ample privacy and cooling effect during daylight and are transparent from the outside with lighting on in the salon. I also have a Sunbrella canvas cover for the windshield that wraps around to cover the first side window. This canvas provides the privacy needed at a dock or when anchored in a crowd or rafted. 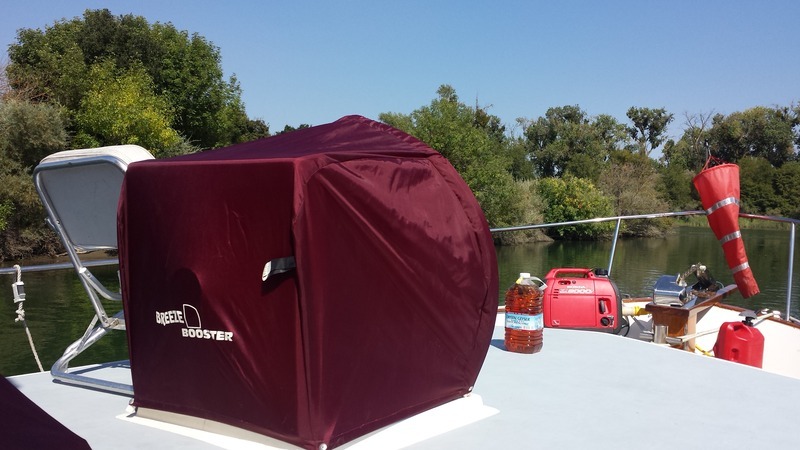 An added bonus is the Breeze Booster we use on our forward hatch to increase the airflow through the boat at anchor. It works great when stationary, but I always remove it when moving. Interior: For privacy, we installed a combination of Levelor faux wood 2 inch blinds on the windows and cordless cellular shades on the doors. The blinds work well, but will slap in the rocking boat. We elected not to use the hold-down brackets and retract them underway to reduce the clanking noise and improve visibility. We chose the blinds for wase of cleaning, especially near the stovetop and sink. The cordless shades work great for the doors since they are easily operated from inside or outside the boat. After 3 years, we just had a failure of the string retraction mechanism on the large double-door aft doors shade. I contacted Lowes where we bought them and they sent them into Levelor for a warranty repair no charge. I should get them shipped back to my house in 3-4 weeks. With the blinds/shades inside and the windshield canvas outside, we have complete privacy. The sunscreens allow us to adjust our increase our incoming light without overheating. They also provide sun protection for my varnished teak window frames. I keep my boat in Vallejo...right near the line between Delta and Bay. If I turn to starboard at the mouth of Mare Island Strait, I reach the cool saltwater and breezy SF Bay. If I turn to port, I reach the warmer, fresh water CA Delta. It seems to provide me the best of both worlds. If you'd like to take a look at the blinds/screens, PM me and you can come by for a look see. I'm at the boat just about every week. We went with double cellular blinds that also open from the top down, without cords. Got them online at Blinds.com. Very happy with them. 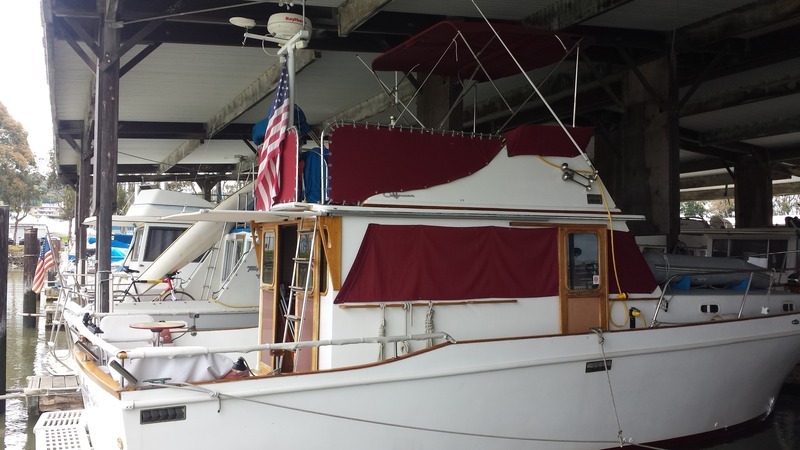 When I bought the boat, it had a solid windshield cover and an array of miniblinds for side windows. Just a matter of personal taste - I disliked the blinds - effective but not my style (assumung I have any style). I had new windshield and side window solid sunbrella covers made, using the existing snaps. I also had 70% sunbrella "screens" fabricated for the side window openings (about 50% of the surface area of the side windows). For underway prep, the solid covers come off and the screens go up as needed. The solid covers (some or all) are employed for privacy when docked. Mix and match, depending on the weather and the situation. I still have some aft saloon glass that needs something, but haven't decided what that will be. Maybe film as WesK used. WesK - what was the 3M product you used? I've seen some applications on boats that did not turn out well - don't know if it was the product or the installation. The corroded snap issue was easily cured on mine with a bit of silicon lube applied once in a while. Exterior mesh is my preference for fwd windows as it provides some visibility while blocking a lot of the sun - difference shade factors available. We value light open living space and don't want to "close it in"
I would get both exterior mesh covers and interior (mini) blinds. I have both. Just recently sewed and installed the exterior Phifertex covers at a cost of <$200 including install tools.. Temp reduction seems to be in the area of 10 degrees or so. They attenuate the sunlight and heat, while keeping the interior pretty bright. Great privacy too from outside. We're really happy with this upgrade. And yes, visibility is such that they do not need to be removed under normal operation..
My boat came with white exterior mesh on all side windows(and enclosing the cockpit), with solid sunbrella type canvas on the windscreen and aft cabin windows. 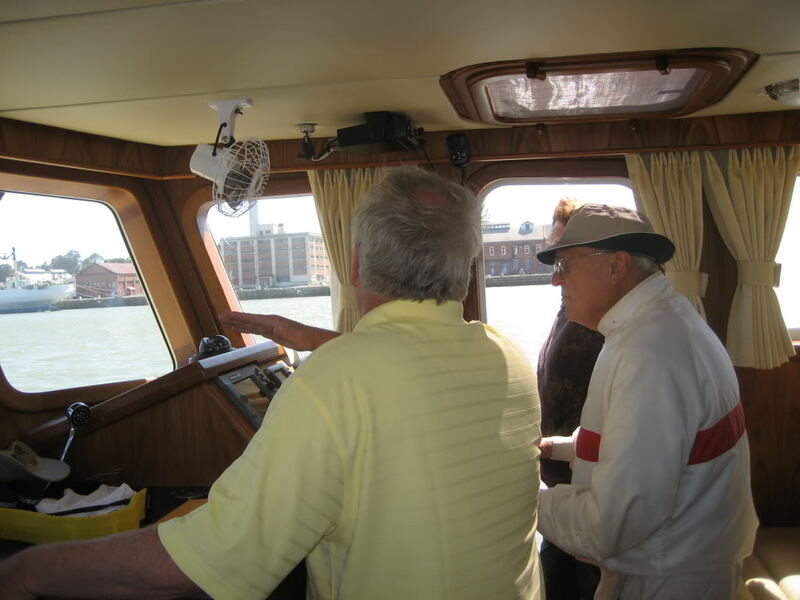 The boat originally had curtaining on tracks on these windows concealed using teak pelmets. We never remove the mesh window covers. I like the idea of interior Venetian type blinds too, provided they can be secured so they don`t rattle. I like the idea of interior Venetian type blinds too, provided they can be secured so they don`t rattle. We have hold down clips (available at Home Depot/Lowes in the blind section) that eliminate all movement and rattling. Easy. For keeping sunlight and heat out of the boat, exterior is better. Once the light has come through the glass into the interior, the heat's in the interior. For convenience and privacy, interior is better (except for the usual sloping windows; they're not so easy). For styling and decoration interior is better. Coatings/tinted glass is great if you've got it or can get a decent, long lasting application. Solid/opaque exterior covers would be best for excluding sunlight but also prevent seeing what you come down to the boat for. The various meshes come in various densities and colors, and various attachment strategies. Given room for the roll, I think that roll up and tie down mesh would be best and most convenient; the snaps are harder to deal with as they and you get older, and you have to store and sort the loose pieces. 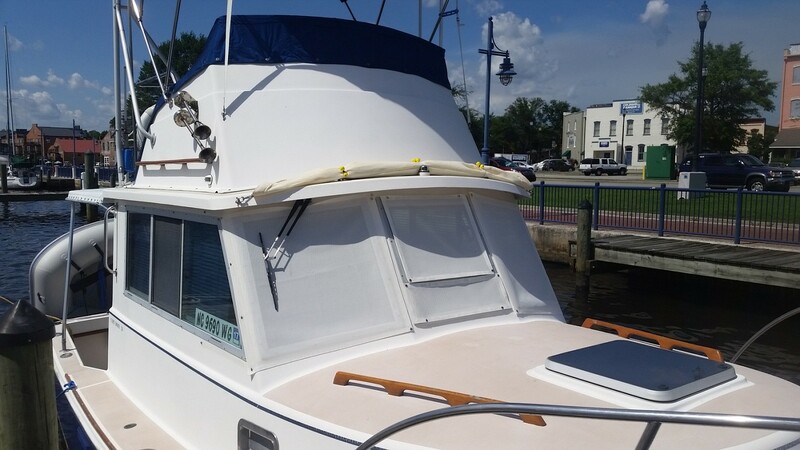 We recently saw an installation we'd never seen: snap-on fabric covers on all windows and those facing forward had narrow horizontal slots with covers that folded up; the boat was being driven from within those slots!). Best is both interior and exterior, with tinted glass on the non-driving windows. I had imagined a way to hinge a permanently-mounted pair of shades. Fabric laced/fastened to a suitable frame. Hinged up along the flybridge rail. Hinged out for shade with view. Hinged down for maximum shade. It would work for non-Europa style boats in the same way. Quickie pics but w/o shading to make it look right - MS Paint, not Photoshop. For the wet and cold Puget system area, we have clear plastic canvas enclosing the Portuguese bridge and the stern. The pilot house window has mess cover and a solid. 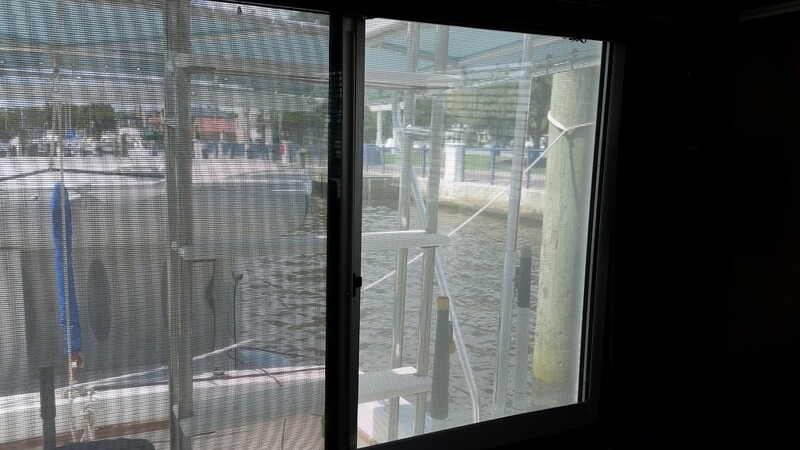 The pilot house and salon side windows have plex glass on the outside as storm Windows reducing condensation and drafts. on the interior heavy curtains to hold in the heat. They also work equally well fore the summer heat. We have very little window condensation. We also installed dark tinted salon windows, but more for privacy. We have interior curtains. They are normally drawn closed when not using the boat or privacy is desired, and opened while underway. I've got the pleated day/night shades that are commonly found in RV's. They operate easily with no rattles in rough seas. ................ Maybe film as WesK used. WesK - what was the 3M product you used? I've seen some applications on boats that did not turn out well - don't know if it was the product or the installation.. I'm sorry, I don't know the name but it was supposedly top of the line and only available through authorized 3M installers. Call one and ask. It's supposed to reflect the heat while not reducing visibility and it does just that. I have both the wood blinds inside and the Phifertex mesh covers on the outside. Hate both. Had to go dive for the second time to recover one of the side window covers yesterday. Each time an extreme wind gust has popped one snap off and then it's only a matter of minutes before the cover is peeled off. Cleaning the mesh after a day in the mud is a PIA! The wood blinds were held in place at the bottom which made opening the windows more of a PIA. There was just enough give in the middle of the blinds to allow them to slap the wall paneling when going into seas. They're dirt magnets and tedious to clean. Ended up removing the hold downs and retract them whenever traveling. Thinking about removing the blinds as they are only for privacy. Plan to be naked in the saloon, which should keep people from looking in more than once. Re: "Plan to be naked in the saloon" TMI !!! !